They and others say a lack of information makes it impossible to compare the project to Statoil's proposal. The two chairmen of the committee that oversees energy issues in the Maine Legislature are asking the head of the Public Utilities Commission to release at least some of the University of Maine’s deep-water offshore wind project application. Sen. John Cleveland, D-Auburn, and Rep. Barry Hobbins, D-Saco, sent the letter on Friday to the PUC’s chair, Tom Welch. The Press Herald obtained a copy of the letter after requesting it from Cleveland. Responding to the newspaper’s questions about how the PUC would handle the letter, Welch said the content reflected the same concerns raised by two other interested parties that had filed formal comments earlier this month, as part of the commission’s review of the UMaine application. The three-member commission will decide how much information, if any, can be released when it meets for an upcoming deliberation session in mid-October, he said. The request from the two leaders of the Energy, Utilities and Technology committee represents the latest attempt to pressure the university and its business partners to publicly disclose some details of its efforts to win a power contract for a demonstration wind project off the Maine coast, a venture that could have a broad impact on the state’s economy and energy future. The project is being developed under the name Maine Aqua Ventus I, GP, LLC. It is composed of a partnership between the university, Maine-based Cianbro Corp. and the parent company of Bangor Hydro Electric Co., Emera, Inc. of Halifax, Nova Scotia. 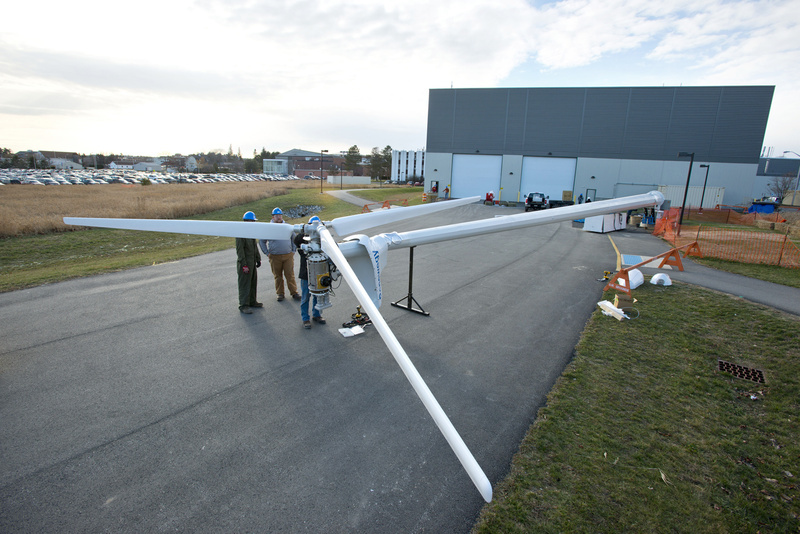 The partners launched a one-eighth-scale prototype of their project in May off Castine. At full scale, a $96 million project located off Monhegan Island would generate 12 megawatts. On September 1, Maine Aqua Ventus submitted a highly anticipated proposal for its full-scale project to the PUC. Among other things, the proposal estimates what consumers can expect to pay for wind energy generated off the Maine coast – at least in its developmental stages. But the partnership chose to keep the entire 100-page document from public view. A lawyer who represents Maine Aqua Ventus, Tony Buxton, said it’s common practice to keep request for project proposals confidential. Making any information public now would provide an unfair competitive advantage to competitors, he said, including Norway-based Statoil. On Monday, Buxton said the partnership would review the letter from Cleveland and Hobbins when it becomes available from the commission. “We will take a look at the letter and respond accordingly,” he said. Statoil already has PUC approval for its 12-megawatt Hywind Maine wind park off Boothbay Harbor. The contract is for power well above market rates, but the terms also called for Statoil to provide certain economic benefits tied to job creation and in-state investment. Those terms didn’t satisfy Gov. Paul LePage, a vocal opponent of wind power. He argued that the rate was too high and the economic benefits too low. In exchange for allowing a sweeping energy bill to become law this summer, LePage engineered a political maneuver in the waning days of the legislative session. The end result was that lawmakers voted to order the PUC to reopen the bid process for offshore wind proposals, and accommodate UMaine. The legislative action also prompted Statoil to announce in early July that it was putting Hywind Maine on hold, citing the uncertainty created by the new bidding process. The company said it would re-evaluate the project in the fall. On Sunday, The Associated Press reported that Patrick Woodcock, LePage’s energy director, had earlier in the year worked behind the scenes in an effort to scuttle Statoil’s project. Asked about the report on Monday, Cleveland said he wasn’t surprised. “I knew from the beginning that the governor was trying to kill the Statoil proposal,” he said. The lack of information means there is no way to compare UMaine’s plan with Hywind Maine. That makes it impossible to get a sense of the overall economic potential of a venture meant to advance Maine’s standing as a center of research and construction in deep-water ocean energy. Two environmental groups, Environment Northeast and the Conservation Law Foundation, sent letters last week urging the PUC to make the UMaine plan public now and to decide its merits by December 31. “The longer it takes the commission to reach its decision, the greater the risk of disrupting an important economic opportunity for Maine’s clean energy future and risking its business reputation,” wrote Beth Nagusky, Environment Northeast’s Maine director, and Sean Mahoney, vice president for the Conservation Law Foundation. The PUC now is accepting comments on this request as part of its formal review of the UMaine proposal. Comments are due on Tuesday, and Maine Aqua Ventus must reply by Oct. 1. In a related action, Mahoney’s group filed a freedom-of-access request with the university and the PUC, in an effort to see the documents being withheld. Similar legal requests for documents also were sent to the university and PUC on Monday by the Portland Press Herald. Last Friday, the PUC responded to the groups and to the newspaper, denying the request. It said the records are confidential and protected from public view under a protective order. Statoil also is asking the agency to see the Maine Aqua Ventus proposal. In a letter dated Sept. 10, the company argued that, as the only developer with an approved contract for offshore wind with the PUC, Statoil should be able to see the proposal, subject to appropriate confidentiality rules. Statoil launched the world’s first full-scale floating turbine in 2009 in the North Sea. It was looking to Maine to expand and refine the technology. The PUC said that the three-member commission will deliberate on the UMaine application and make a decision by Dec. 31. No specific date has been set for deliberations.